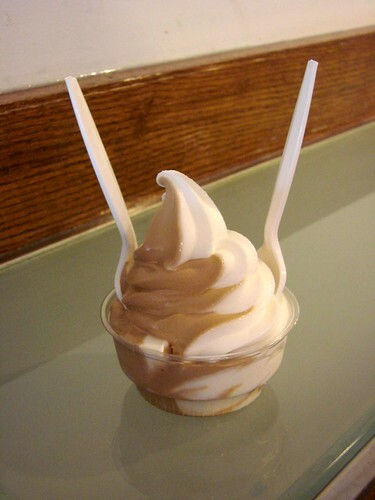 Blondie and Brownie: Frogurt! Frogurt! Massive Amounts of Frogurt! 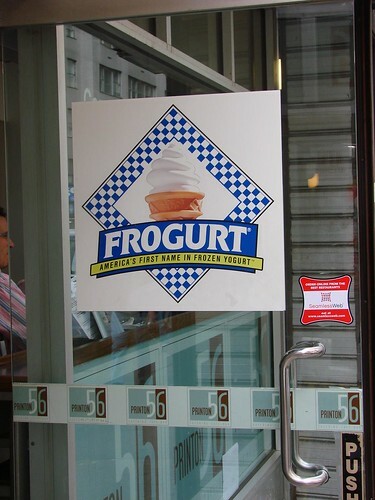 As I was strolling 56th street between 5th and 6th on my way to pick up ramen from Mei Kui Tei I noticed Printon 56's big Frogurt sign and I couldn't help but be drawn in. What I discovered was not one measly Frogurt pump but a sleek operation. Three machines! Six flavors! I spoke to the lady behind the counter and she said that they regularly have Plain, Vanilla, Dutch Chocolate and Caribbean Coffee and they rotate in two flavors on a daily basis. One of the times I stopped by they had Banana and Strawberry and other time they Peanut Butter. 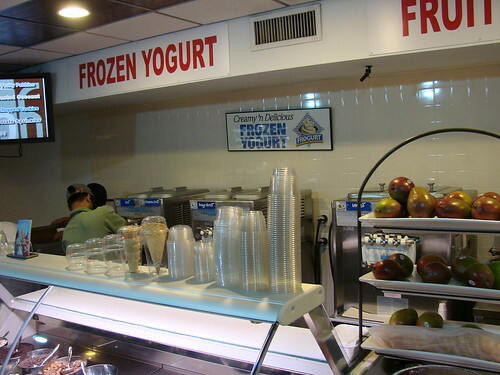 I've been to other places that sell Frogurt but don't keep their machines quite as cold as at 40 Carrots so the froyo comes out icy and melty. Not so at Printon 56. I haven't gone through all the flavors, but the froyo I tried did taste comparable to what you get at 40 Carrots. I've never had 40 carrots but Printon's fro yo is pretty yummy. 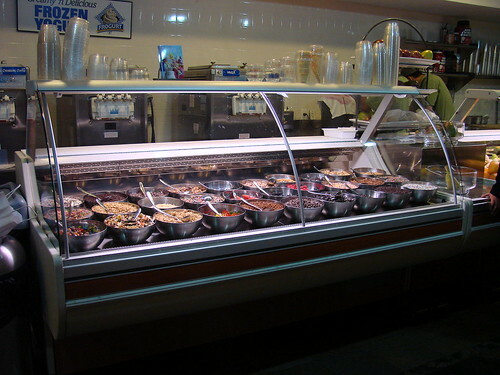 However, I can't seem to bring myself to pay $1 for each topping!! @ambitious: I totally hear you, $1 per topping seems kind of ridiculous. I generally don't get my frogurt with toppings from 40 Carrots, but when I got to Printon, I definitely eyed the raspberries until I saw the price tag!